The Ancient Egyptians’ fascination for their afterlife was legendary. The temples, tombs, mythology, literature, etc, contained myriad references to death, afterlife and all the preparations that a soul would need after death. The most important thing one sees in the tombs is the coffins itself. The paintings, sculptures, jewelry, texts engraved and the pots and vessels are only secondary to the main coffin itself. 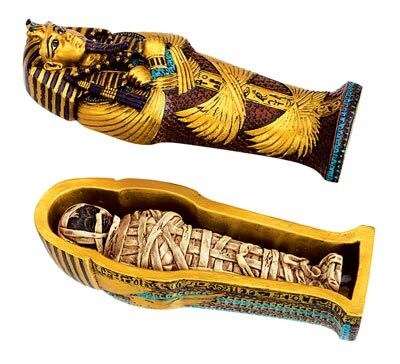 The coffins, which contains the mummy, could be simple or intricately adorned. The pharaoh, his family and the well to do families of Egypt arranged for their funerals long before they died. In fact, the preparations for the tomb, designs, amassing of treasure as such began years and years before the actual death. The main use of a coffin is to protect the dead body, preserve it so that it does not deteriorate or get mutilated. Prior to actual coffins, the Ancient Egyptians covered bodies in a mat or a fur and put them in coffins made of clay or a crude wooden one. The Ancient Egyptians used to place tombs in a sarcophagus, which means flesh eater in Greek. However, the Egyptians meant it as new Ankh which means the possessor of life. There are a few different interpretations of the word, they are Wet and Suhet. The exact meaning is not known, but it pertains to the bandage strips for a mummy and embalming, begetting, rebirth, etc, there can be various meanings, each reinforcing the Egyptian belief of afterlife and protection of the dead. 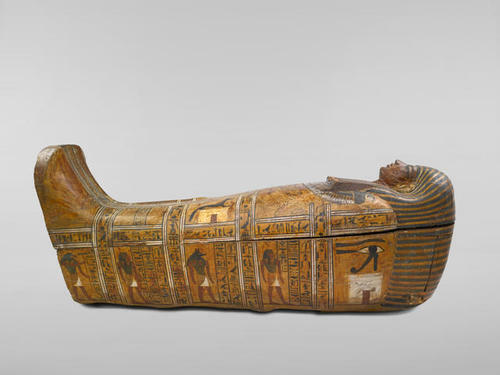 The Third dynasty saw royal coffins for the very first time and lasted this long as they were usually made of stone. The earlier ones were not decorated or engraved with plain lids. Naturally, the coffin of a member of the royal family was totally different from that of an ordinary citizen. The difference being the extravagance in the tombs and coffins. They used to paint the walls and the inside of a tomb. The Egyptians adorned the coffins and the wall since almost the beginning. A false door and a facade became popular from the Third dynasty onwards. These were mostly used for royal burials and mummification. Unas started the practice of falso doors, facades, painted walls, etc. Regular people other than the Royals also began decorating the coffins, but not on the same scale as the Pharaoh. The coffin sometimes had a pair of eyes etched or painted upon the lid so that the dead could see. Lines of hieroglyphics engraved in and on the door of the coffin and an inventory of the things offered. Coffins were usually rectangular but later an anthropoid coffin began to be put into the normal regular coffin. The face of the dead was often replicated upon the outer coffin. Vulture wings began to be added. The coffins of royals were plated with gold.